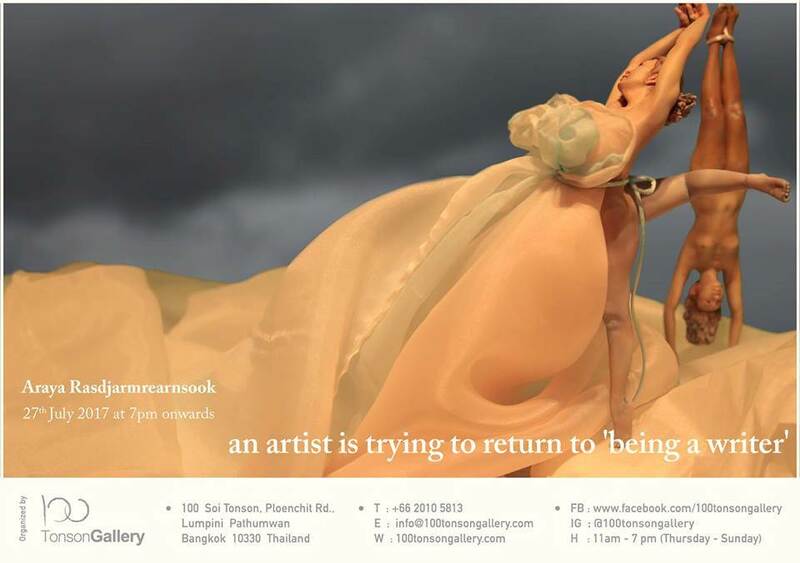 For this exhibition at 100 Tonson Gallery, Araya presents her new sculptures and videos including ‘The Cruel ’ (2017) a humorous reenactment of the artist’s habilitation meeting where other esteemed professors whom are also important figures in Thai art world, critiquing the artist's controversial works which were never accepted in the academic circle as well as the general public in Thailand. The critique indicates the tension of what constitutes permissible or moral within the national art scene. “Niranam Yummayooshi" (2015) is a soundless video accompanied by two sleeping figures titled “The Dead Ovary Lullaby” (2016) where both, a woman and a dog fall asleep under a glimmering light. They then travel to different dreamscapes, the ocean, and the grasslands or on top of an injured skin. Meanwhile, an image of a body started to form, layered and simultaneously dissolving its origin. Together, collaged with fragments of mundane experiences such as running and playing, to be wounded and to be covered. For more information please contact us via [email protected] or call +66(0)2-510-5813.